The Friendship pattern was a response to contemporary market trends toward “country living” interior decorating. A promotional version of the Friendship pattern was released in 1971. Called “Penn Dutch,” it was slightly denser in floral arrangement and was evocative of the Pennsylvania Dutch style. The Friendship pattern marks an era of nostalgic country themes. Along with Autumn Harvest, Butterfly Gold, Spring Blossom Green, Snowflake Blue, Homestead, Old Orchard, Old Town Blue, and Woodland, Friendship mirrors the contemporary trend of country décor. When Friendship first appeared in 1971 it was accompanied by a full array of items, including Mixing Bowl sets (400 &300), a Cinderella Bowl set (441-44), and Refrigerator set (501-03), Round Casserole set (471-475), and a range of Bake Ware products. 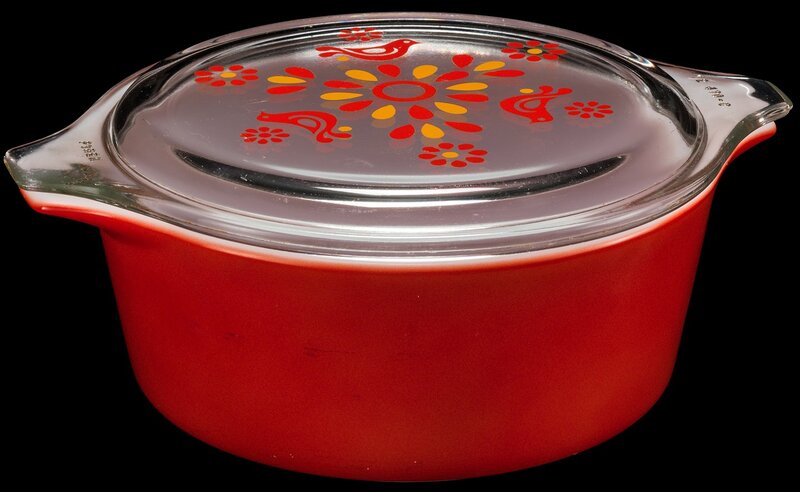 The nesting bowl sets contained a solid orange, a solid red and two different size bowls with the Friendship pattern on a white background. Around 1972, clear patterned lids were replaced with opal lids with the same design. A favorite pattern among collectors, Friendship is evocative of rural Pennsylvania Dutch designs. Interestingly, in 1971 a promotional pattern called “Penn Dutch” was released with a denser arrangement of the bright orange and red bird motif of Friendship. Friendship remained available until 1974.